Mahalaya Paksha starts on Friday 16th September and it ends on Friday 30th September in 2016. The Krishna Paksha dark fortnight of Ashwini Month/Aswayuja (September–October) is known as Mahalaya Paksha. Mahalaya Paksha starts on Bhadrapad Maas on the full moon day. Tarpan during the auspicious Mahalaya Paksha will bless ancestors and will free them from all their sins. Donating food is considered to be the greatest charity of all the charities. Mahalaya Paksha begins with the full moon day (Purnima) that occurs immediately after the Ganesh festival and ending with the no moon day known as Sarvapitri amavasya, Apart from this Shraadh is also performed on the birth star of the dead person and also on the nakshatra the person died. If death anniversary of ancestors are not known or forgotten then those Shraadh can be performed on this Mahalaya Amavasya. Mahalaya Paksha is also called as Pitra Amavasya or Pitrulaya Amavasya. Mahalaya Amavasya 2016 date is Friday 30th September. The male who performs the Shraadh should take a purifying bath should wear a dhoti. The Shraadh involves pinda-daan, those are offering to the ancestors of pindaa's. Shraadh should be performed in front of a brahmin. Pindam (It is prepared by combining the wheat flour, water and milk). The total number of pindaa's will be six. in which three are large and three will be small. Dharba grass is made like a ring and it is wear to the middle finger. Gingelly (Thil/Nuvvulu), vermilon (kumkum), turmeric, flowers, akshintalu pour on the pindaa's while chanting the names of the dead people like grand father, forefathers like last three generations. Then the pindaa's will be released in to the rivers, lakes. After the pindaa pradana take a bath in the river. 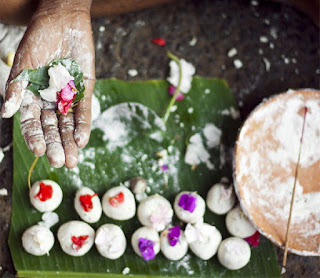 Some sweets are made in home and it is given as nivedya. Donating food, vegetables, rice, grains, clothes on this day will be graceful. On Amavasya Shraadh is done to forefathers by Brahmin's whose father has died earlier. Now-a-days a short 20 minute version of the ceremony is done then offering black sesame and water as oblation to departed souls. Olden days naivedya preparation Started earlier at 5 am and tarpanam given at Aparaanha time.